Make your grand entrance into any party with your personalized wine tote in tow. You can keep them for yourself or they make great hostess, wedding, or house warming gifts. With the design and personalization options available you can customize them to fit your style. The wine totes have durable, reinforced handles to make sure your wine bottle travels safely. 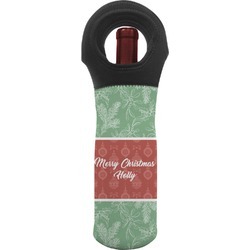 The insulated material they are made of ensure that your wine stays cold too!! These totes are perfect for casual wine drinkers and connoisseurs. Try one today!